Modern-eclectic seems deceptively easy - just combine items and they don't even have to match - but the right mix and balance is tricky to achieve. Too much and you end up with what one of our clients below describes as a "hodge-podge" of a room. It's no surprise, then, that this is one of the most commonly requested styles that customers ask for help with, across a wide range of budgets. Great modern-eclectic design, however, doesn't have to cost a fortune and our 3 rooms below are proof of that. Tricky to achieve? Yes. Achievable in any budget? Definitely. 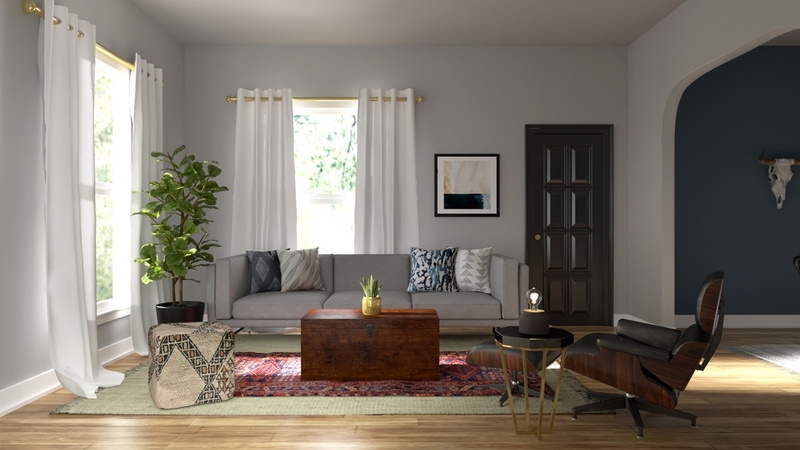 This modern-eclectic room started out its project life in a different style - the client had requested a casual living room with "hints of traditional" from Decorist Classic designer Tera Hammerly. However, once the client saw the design concepts that Tera had put together for her space, she found that everything she loved leaned more modern-eclectic. 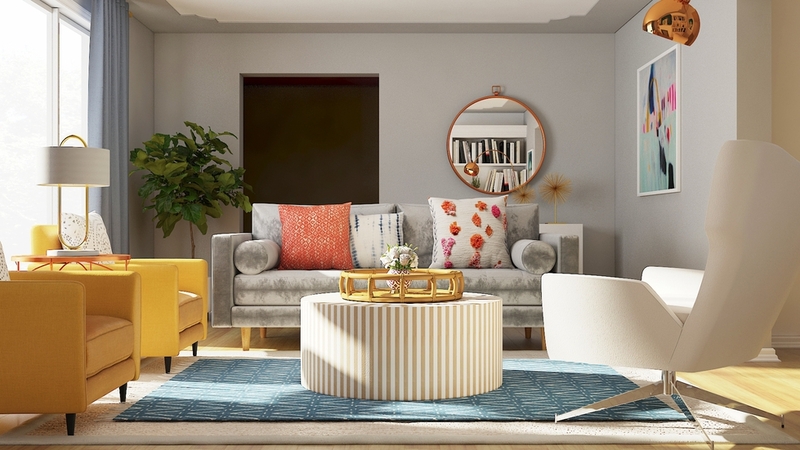 Once they started talking, Tera realized that what her client actually loved from the traditional inspiration pictures was the symmetry of the designs - knowing that, she brought symmetry into this room: the nesting tables mirror and balance out the sectional sofa, which is paired with matching side tables and lamps on either side. One major benefit of working with a professional designer? Having her realize what you really want is actually what you didn't ask for. We love this next room because it's a great example of how modern-eclectic doesn't necessarily have to mean avant-garde. This design takes modern pieces and then goes the other direction, with a mix of antique, vintage and handcrafted items for a global-inspired eclectic vibe. This client had just moved into a new home - a 1920s bungalow - and had recently invested in a sofa that she loved and that had looked perfect in her old modern loft space. With the move, the sofa now looked a little out of place. Decorist Classic designer Jessica McCarthy designed the room with a carefully curated collection of items - a mid-century modern recliner, an antique trunk, a handcrafted mudcloth ottoman and a Persian rug - that made the sofa fit right in and made her client feel right at home. 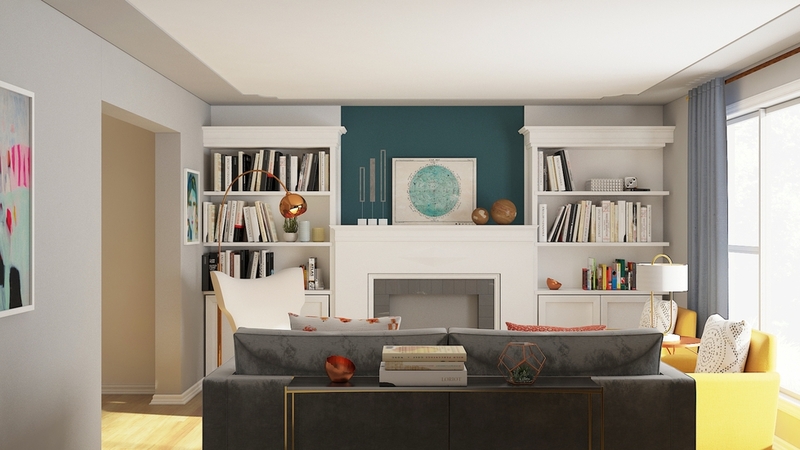 This client has always loved the mix of styles in a modern-eclectic design but admitted that her own efforts had left her with "a hodge-podge of furniture and decorative elements" and while she loved color, she had "trouble finding the right balance between colorful walls, rugs and furniture." 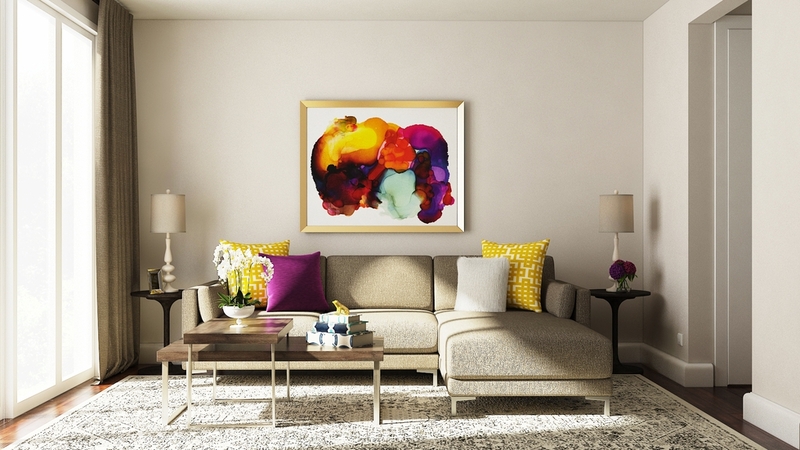 Enter Decorist Classic designer Caitlin McBride, who brought the saturated colors her client loved but balanced it with light neutrals - light gray walls with colorful art, neutral velvet sofa with a pair of sunflower yellow parlour chairs - and copper accents throughout. Because her client's room didn't have any architectural details, Caitlin included built-in shelving around the fireplace to replace the wall-mounted shelving her client had to add visual interest and weight to the space - fun fact: her client mentioned she was handy and liked DIY renovation, so Caitlin found and sent her a tutorial to build those herself.